I was inspired to build this bike by OSSA expert Steve Levi, who lives in Iowa. Steve worked for Yankee Motors back in the day and was the lead developer on the ST-1 project. He’s a performance engine expert! Anyway, he built a quarter-liter bike/street tracker, quite beautiful with orange body work. He had the fiberglass gas tank and seat pan made to replicate the OSSA road racers in Spain in the ‘60s. We threw parts in the corner for this project for several years – I had an SDR donor bike, Stiletto frame from Karl Heise, a 19-inch front wheel and a Desert Phantom engine. I finally got enthused to construct the bike when Steve was able to supply the body work, then we added a stock OSSA front fender and Rickman handlebars. I’ve never owned a black motorcycle, so I thought this was a good time to try one. The white and green accent came from the OSSA MAR. Custom suede seat by Charles! 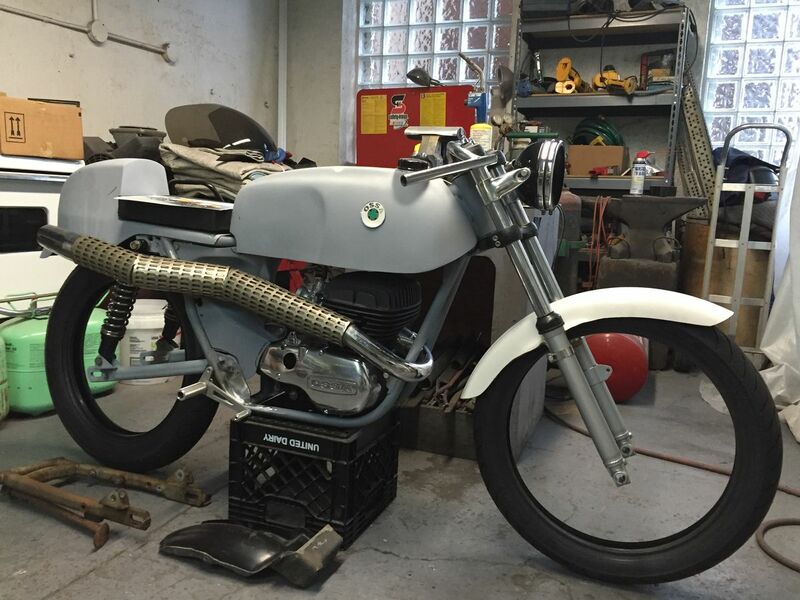 We still have to build the motor – just got the crankshaft back from rebuild a couple of months ago, still agonizing over the exhaust… Everybody builds them with the low pipe, so naturally I wanted a high pipe. This one came off a 175 – I would really like to get a custom upswept pipe. We’ll see!